Russian President Vladimir Putin has told Russia’s human rights ombudsman he will speak with law enforcement officials about the reported torture of gay men in Chechnya. Tatyana Moskalkova asked Putin on Friday to support her request to form a group in Moscow to investigate the treatment of gays in the southern Russian region. The abuse was first reported in April by the independent newspaper Novaya Gazeta, which said about 100 suspected gay men were rounded up and tortured, and at least three were killed. Putin’s comments reflect how Russian officials have played down the report. Moskalkova earlier said she doubted such abuse took place. 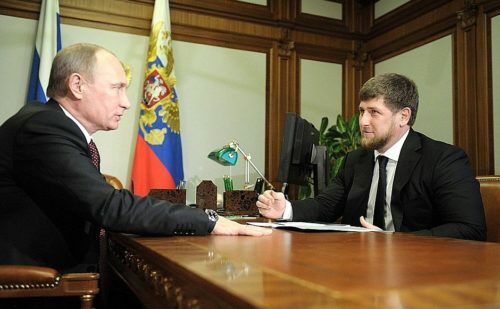 Chechnya’s president Ramzan Kadyrov said Friday that the republic’s officials and police would cooperate with the ombudsman “in checking the media reports of the persecution of people of nontraditional orientation that supposedly took place,” state news agency Tass reported.